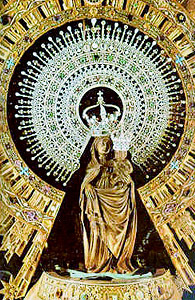 The Virgin of Covadonga is among the earlier apparitions of Our Lady, in which She appeared to the monarch, Don Pelayo and inspired the reconquest of Spain from the Moors. Recently, several books enumerating the apparitions of Our Lady were published in Italy. When I had the opportunity to take a look at them on a recent trip to Rome, I was surprised. While in one epoch, there were numerous apparitions, in another they were very rare; in one epoch the Holy Virgin appeared to one class of people, in another she appeared to an entirely different class. During the nineteenth century, there were very important and approved apparitions, for example Lourdes, but also an inflation of false ones, perhaps indicating that the devil had been given permission to confound souls as a chastisement for sin. What I found most interesting was how these apparitions always served the most pressing needs of the Church. Thus, during the conquest and conversion of the Americas, Our Lady appeared many times to the Indians, helping the missionaries to catechize, baptize and civilize them. However, I have never heard of an apparition to support the “neomissionaries” of today, who are determined that the Indians remain in an unbaptized state of barbarity. In the nineteenth century, there were various apparitions of the Blessed Virgin to the saint founders of religious congregations. These greatly aided the world-wide expansion of Catholicism. This era also saw apparitions linked to the diffusion of Marian devotions, like the miraculous medal. As I read, I became eager to analyze one point with more detail: what was the purpose of the first apparitions of the Mother of God? Our Lady appeared to St. James the Greater to instruct him to build a chapel in her honor. The conversion of Spain was unimaginably difficult. Saint James, the Apostle, expended tremendous effort and suffered to convert the area’s long-enduring pagans. To encourage him, Our Lady, who was still living at the time, appeared to him on a pillar in the city of Caesaraugusta (currently Saragossa). She told him that in the future the faith of the Spanish people would be profound and serious. Very consoled, the Apostle continued his arduous work. The results of his labors are evident today. 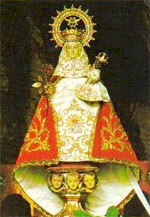 A considerable part of the Catholic Church prays in Spanish and Our Lady of the Pillar is the Patroness of Spain. Technically speaking, this was not an apparition in the theological sense of the word, but rather a bilocation (being in two places at the same time), since Our Lady was still present on earth. Therefore, the following story can be considered the first true apparition of history. All the Apostles were gathered in the Greek city of Ephesus, on the modern coast of Turkey. While beseeching the aid of the Most Holy Virgin regarding the various difficulties of the nascent Church, the Mother of God appeared, full of light, and promised never to abandon them. Since all the Apostles together represented the Church Hierarchy, this apparition can be seen as a promise that Our Lady would always aid the Church’s leadership. This help would be continually demonstrated throughout history. The next apparition we will discuss seems to be intentionally geared to teach God’s ways to those who think that Church progress can only occur in spectacular, brilliant and immediate ways. On the contrary, the dissemination of this apparition could scarcely have happened in a slower and humbler way. Around the year 70, a converted woman, living in Le Puy, in modern-day France, was gravely ill. After seeing Our Lady, she was cured and built a small chapel on the site of the apparition. Throughout history, other miracles were performed there, which gained a certain popularity for the shrine. Pilgrimages to the shrine slowly grew until the nineteenth century, when a Church was built on the spot. After 1700 years, the shrine had slowly become a center for pilgrimages. The local bishops accepted the devotion, which represents perseverance throughout centuries rather than spectacular miracles or resounding revelations. This is often how things happen in the Church. A little work is accomplished each day. Although this work seemingly bears no fruit, it conquers through perseverance and in the end gains success and a great good. After the era of persecution and martyrdom had ended, the devil, having been unable to destroy the Church through violence, sought to destroy Her by sullying Her doctrine with heresy. Today, the logical, solid, consistent and admirable collection of Church teaching seems to be the most normal thing in the world. However, much effort, polemics and persistent study, all inspired by the Holy Ghost was necessary to arrive at this point. For example, it took ten centuries to doctrinally express the sacraments with a clear and precise definition. One can hardly measure how much prayer, work and study was employed to achieve the admirable cathedral of church doctrines, many of which are only implicit in the Gospels and Tradition. It is not surprising that the devil wanted to introduce cracks in this doctrinal foundation. Thus, the heresies strove to topple the magnificent doctrinal building of the Church of Our Lord Jesus Christ. To defend the Church, Our Lady appeared many times to the bishops, successors of the Apostles, in fulfillment of Her promise never to abandon them. Thus, She appeared twice to Saint Nicholas, Bishop of Mira: the first time, when he was named bishop, the second shortly after the Council of Nicea. Saint Nicholas, whose admirable charity we celebrate at Christmastime, was a great defender of Catholic doctrine concerning the divine nature of Our Lord. Forty years later, the Virgin appeared to Saint Basil of Caesarea, the great defender of the doctrine of the Holy Trinity. Around the year 370, She appeared several times to Saint Martin, bishop of Tours, pledging Her assistance in the formation of future holy bishops, who would profoundly change France. Today, many people have difficulty measuring the doctrinal importance linked to such apparitions. To them, philosophy and theology seem to be “vague” sciences, concerned with theoretical problems that are inconsequential to daily life. Nothing could be further from the truth. For example, as the Church strove to present the true doctrine of the Gospels on the nature of Our Lord Jesus Christ, true God and true man, with clarity and precision, the devil attempted to show Him only as man or only as God. But if Our Lord were only man, the Catholic Church would not have a divine origin and if He were only God, it would empty the Redemption of meaning and render it inimitable by man. One thing for sure is that from the days of the early Church to today (as seen in the apparitions at Fatima), Our Lady has always placed Herself at the center of the fight between good and evil. This entry was posted in Devotion to the Blessed Mother, Medieval Saints, Middle Ages and tagged Apparitions, Church, Covadonga, Doctrine, Don Pelayo, Our Lady of the Pillar, Spain, St. James, St. Nicholas by Valdis Grinsteins. Bookmark the permalink.